Click here for Specialty Chats And here for Weekly Chat Schedule. Need to Register??? Click Here! Ready? Log in Click here! Miss some previous chats? Click Here, some are on transcripts! ABOUT THE NOVEL: When Q, a smart ambitious New York lawyer, is confined to her bed during her final three months of pregnancy, she must do everything she can to keep from going crazy. 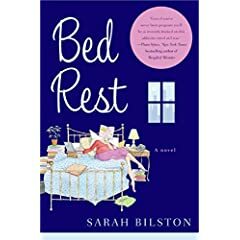 In this humorous and touching debut, we see just how interesting things get as her workaholic husband, romantically challenged co-workers, snide British sister, and sweet Greek neighbor swirl around Q, her ever growing belly, and her bed.
" Quote by Sarah Bilston"
The truth is, being in a high-risk pregnancy has changed my views on labor and delivery completely. You may log in here. Check here for your local Time Zone! Love People? Love to Chat? Got an hour or two a week where you could host a topic or an open chat? Lesliear & Sunny Front Porch "Coping Without Chat at Parenthoodplace.com!" Monday 10 p.m. Copyright 2001-2008. ™ Please read disclaimer.